I was at a conference recently speaking about ARFID (avoidant restrictive food intake disorder) with folks who treat eating disorders and some who provide early feeding support in the community. When I can, I reserve a chunk of time for discussion and Q and A– for selfish reasons, partly. I almost always come away with some new tip, story, or information that has tremendously shaped my work over the years. Anecdotally, Jenny and I find that more fathers than mothers tend to struggle with letting go of rules and pressure; one area in particular is manners. One attendee talked about her rural area where there are a lot of fathers who are in the military, and that she observes that these dads seem more insistent on rules, order, and compliance with manners. For one family struggling with extreme picky eating, there are many mealtime battles around trying to get the kids to eat with elbows off the table, knives and forks held a certain way, not too loud, all asking to be excused only after everyone has finished… The fighting about manners adds to the tension and conflict over who is eating what and how much. The first STEP when we work with parents (and in our book) is to address anxiety. Anything and everything parents can do to reduce anxiety around mealtimes and food is fair game. Why? Because for children with low appetite signals, anxiety, fighting over elbows on the table, or negotiating about how many bites of X food they have to eat amounts to internal noise that makes it hard for the child to feel and sense those subtle hunger cues. The chapter dealing with anxiety is the longest chapter in our book because anxiety is so prevalent for families struggling with picky eating (72% in one study of adolescents with ARFID). In terms of fighting over manners, we recommend that families put the manners on the back burner to get rid of any unnecessary anxiety or source of conflict while working on calm and pleasant meals that support appetite and curiosity around new foods. But some dads (and moms) seem unwilling to let this go. So, another attendee chimed in with advice that I have permission to share. She says that what has helped with her military or law enforcement dads is using language and concepts that they are familiar with, often from their training. In this case, the acronym WIN. What’s Important Now? Manners may be important, and we can get behind that. 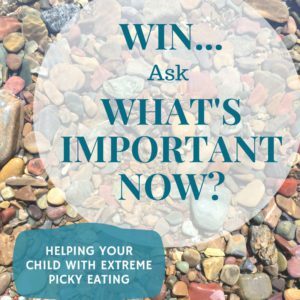 But if a child is struggling due to extreme picky eating, is anxious, maybe not gaining weight in a healthy way for them, or missing out on social events, and possibly getting more picky, what is most important NOW? We believe this is decreasing anxiety and supporting appetite. It’s a kind of triage. Let’s get a handle on step one, decreasing anxiety to support appetite and curiosity, see progress there, and then think of ways to reengage with manners. She shares that framing the issues in this way helps dads see that they aren’t giving in or giving up on manners, they are just focusing their energy on more important tasks.